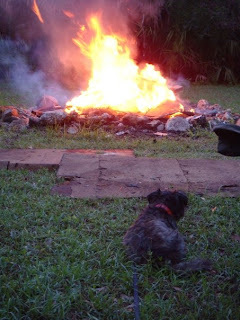 This is me at an evening bonfire in Big Cypress National Preserve. My people friends and I traveled there, helped rebuild a friend's cabin and then stayed overnight. Although Big Cypress National Preserve is home to a diversity of wildlife including black bears, alligators, snakes and the endangered Florida panther...I did not see (or smell) any of them around the cabin area. And don't worry, I was not allowed to roam free; I was leashed to one of my people the entire time we were outdoors! Going to Big Cypress National Preserve was my first real wilderness experience and it was a lot of fun. Lounging by the bonfire in the evening was the highlight of my trip! I wonder where my travels will take me next?